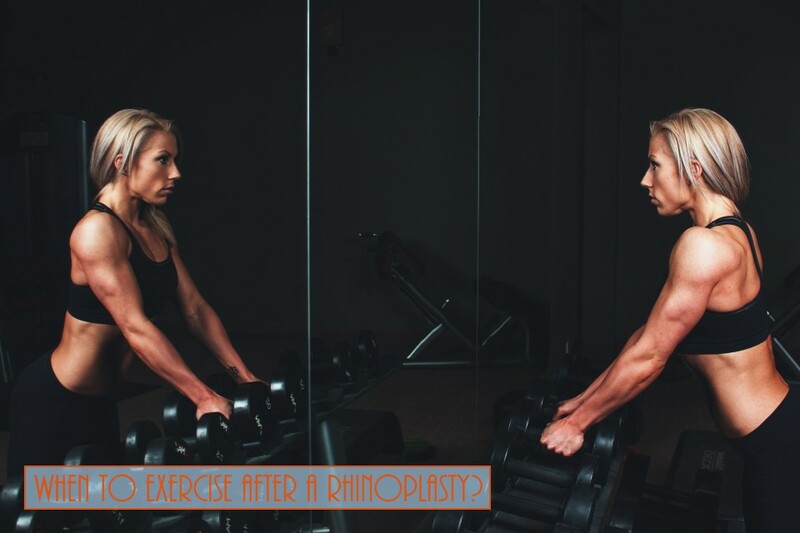 Home > Blog > When To Exercise After A Rhinoplasty? People decide to get a nose job, or rhinoplasty, to change the shape or appearance of their noses. The procedure often is done to restore balance to a face, get an unsightly bump removed or to repair obstructed airways. The cosmetic procedure is considered major surgery and requires at least 10 days of rest and care not to upset the delicate work. There are a number of exercises that must be avoided for various time periods after a nose job. Even though it may not be as restrictive and serious as tummy tuck or breast augmentation, rhinoplasty is still an invasive procedure that requires at least one week of rest minimum. After that period is over, you can start walking around in order to move your muscles a little bit. You might feel good as you stand and walk, but that doesn’t mean that you’re ready to hit the gym so soon after the surgery. Walking is allowed the day after surgery. Many physicians encourage mild walking, as much as patients can tolerate, to prevent any blood clots from forming after a surgical procedure. Running, jogging and any other aerobic activity is prohibited for the first week. Light aerobics should be added to the schedule slowly at first. In addition to safeguarding the stitches and allowing the bones to heal properly, breathing will be obstructed for at least two to three weeks because of the swelling in the nose, making intense exercise more difficult to sustain. Any exercises that require bending over should be avoided for the first week. That includes touching toes, crunches and lifting. For at least a week following the surgery, the patient should not lift anything heavier than 10 lbs., including small children. The pressure from lifting and bending can cause the stitches to pop and slow the healing process. Sexual activities should be limited and not include any aerobic moves either. It may be better for patients to sleep alone for the first week following surgery to avoid any accidental bumps by flailing partners in the night. If you used to deal with a lot of running, contact sports and heavy lifting, be aware that such movements are only safe to try again six month post surgery. It might sound too long, but your health is at stake here. Each person’s recovery is different and you shouldn’t risk nose bleeding and any other kind of complications. Since you’ll be able to move your body it’s important to replace the most challenging exercises with their safer and bounce-free alternatives until your doctor says that it’s fine to get into those again. Any sport where contact is a possibility is not recommended for five to six months so as not to cause any problems with the weakened nose area. Swimming is also not recommended for about six weeks post-op. Patients should refrain from sports and activities in bright sunlight as any kind of sunburn can impede the healing process and cause additional swelling. Sunblock should be applied any time the patient is in the sun. Moving around one week after rhinoplasty is actually encouraged, but be sure not to overdo it. As mentioned before, some light gym routines are possible to do after a month, but the most difficult and physically challenging training sessions should be practiced only when six months have passed. This is precisely why it’s so important to stay in contact with both your doctor and fitness instructor. Most often, people are not fully aware of the intensity of a particular workout and a professional in that area can give you a valuable advice.